Friday at daylight was still windy.It looked like a nice day to come.A quick coffee and bannock for breakfast before heading out on the lake to explore.While we ate the same Common Merganser Hen with the nine babies returned to the same location as the night before.They proceeded to climb onto a log and began preening themselves. We spent a leisure morning exploring among the islands and various coves at the bottom end of David Lake.As we paddled a Loon was observed with a small chick on her back.This little one was probably a result of a second hatch.The first eggs may have been destroyed for what ever reason. We soon came across other campsites along the way and decided to camp further down the lake for the night.The location is shown in the previous post.Dismantling the campsite we relocated to the chosen campsite without incidence and set everything up.It was a beautiful warm day.Wearing the life jackets, we went swimming in front of campsite.Lazily floating on the water and splashing one another. The evening did not produce much in the way of photographing other than a very nice sunset.The majority of our photographing this trip happened early Saturday morning.Walking along the shoreline behind the campsite I captured the above photo with the three small rock islands that you see. 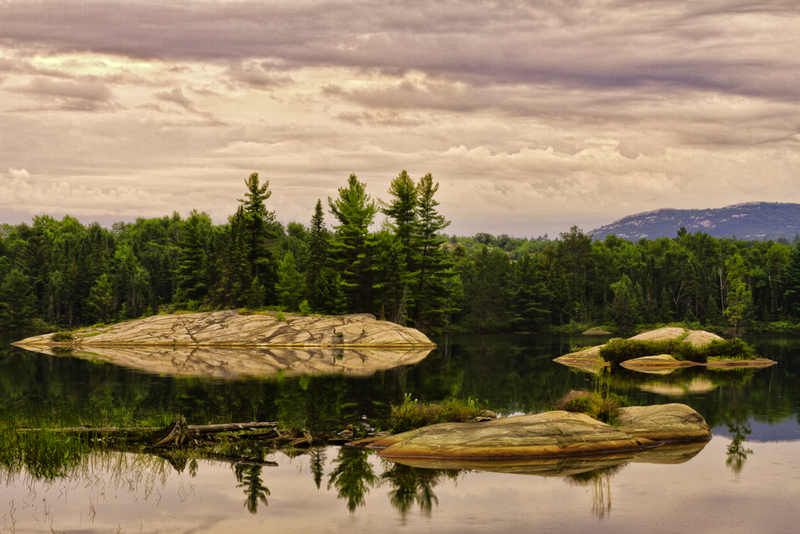 The La Cloche Mountains can be observed in the upper right hand corner.